This single-storey dwelling was designed by US studio Klopf Architecture to have a quiet presence, out of respect for neighbouring buildings and the natural context. 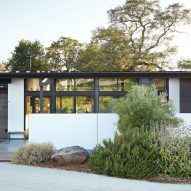 Built for a married couple with grown children, the Sacramento Modern Residence is located in Orangevale, a sunny community near Sacramento in Northern California. The dwelling replaces a ranch home that formerly stood on the site. The clients wanted to renovate the old home, but its slab and foundation were damaged beyond repair. The three-bedroom house is situated on a large plot in a semi-rural area and is surrounded by large oak trees, an open field and a seasonal creek. 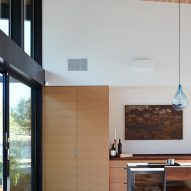 "It is a calm environment that invites a close connection with the house," said Klopf Architecture, a San Francisco-based studio that recently remodelled a mid-century Eichler House in Silicon Valley. An openness to the outdoors – along with clean lines and simple details – were among the design requests by the clients, who previously lived in a midcentury-modern home. 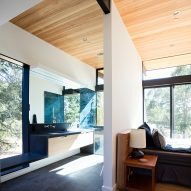 "The clients' primary goal was connecting their indoor living spaces to nature in all parts of the house," the architects said. It was also important that the house sit lightly on the earth and "keep a relatively low profile out of respect for neighbouring houses". In response to these requests, the firm conceived a single-storey bar with ample glazing and deep roof overhangs. In the great room and master bedroom, floor-to-ceiling glazing and sliding glass doors provide a seamless connection between inside and out. The great room opens onto a large terrace sheltered by a metal and fabric canopy. "In the beginning of the day, when the sun is low and direct in the front of the house, the couple can open their rear sliding glass doors or live outside on the rear decks," the firm said. The firm also placed a shaded patio in the front of the dwelling, where the owners can take refuge later in the day, "when the sun is blasting the rear of the house". "Despite the harsher sun and climate in the area, the outside environment can always be experienced comfortably," the studio said. The home is topped with a sloped metal roof, which starts low in the front and rises up in the back. "This was intended to create a more humble appearance from the front of the house while still engaging the rear of the side as much as possible," the studio said. The team clad the dwelling in white stucco and composite siding made of recycled material. "While natural wood siding looks great, it wouldn’t last long under the harsh sun conditions in Orangevale," the firm said. The composite siding resembles wood but requires less maintenance. 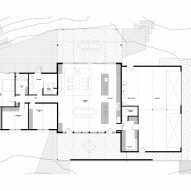 The home encompasses 3,603 square feet (335 square metres), which includes a 970-square-foot garage (90 square metres). Finishes in the main living zone include exposed concrete floors, composite material counters and white oak cabinets. Reclaimed white oak flooring was used in the bedrooms. The firm employed a number of sustainable strategies, such high-performance glass, "thermally broken" aluminium window frames, LED lighting and high-efficiency heating and cooling units. In addition, the team used both in-wall insulation and a continuous layer of rigid foam insulation on the exterior. "This area gets quite hot in the summer," the firm said. 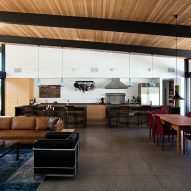 "In response, Klopf designed the house to feel comfortable and still be energy efficient year-round." The owners intend to live in the new home after they retire. The husband is a TV producer and the wife is a chef with her own restaurant. "They are both very creative in their respective fields," the firm said. "They brought their collaborative creativity to the design process for the house." 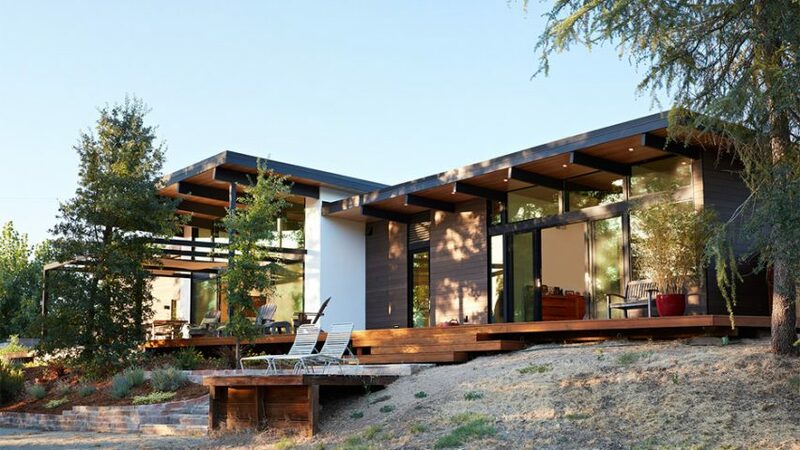 Other homes in Northern California include an off-the-grid retreat by Malcolm Davis that is clad in weathering steel and a white barn-style house by Turnbull Griffin Haesloop.